These ten numbers in sequence constitutes what I call the Genesis Formulae. All that is being done here is extrapolating from the numerical data already produce in the word Bereshith: 4-1-3-1-2-2. As you can see I went only as far as producing equal parity at both ends of the equation. Anything else would be going beyond the scope of reason. As the letters of the Hebrew alphabet were rejected and sent back out of creation it can be determined that Ghimmel (also spelt Ghimel) went before Beth and that Daleth went before Ghimmel. The word Bereshith has a total numerical value of 913. The other four letters in the Genesis Formulae total to 117. This is a combined total of 1030. This total will actually have a great deal to do with the Precession of the Equinoxes. Totaling all the words of the first chapter in relationship to it infers that data. Now when we look at the Genesis Formulae with its dividing factor we can see one of the most famous statements in the New Testament played out in the word Bereshith. Notice how Ghimmel goes, before Beth, out of creation. Ghimmel had to pass Qoph. Now seeing the letters of both ranks are combined Qoph is in front of Ghimmel and Ghimmel has to go through Qoph to get out of the material creation. In the Hebrew alphabet Ghimmel is #3 and is symbolically represented by the word 'Camel', whereas, Qoph represent the #100 and symbolically the 'back of the head" but it also means 'Needle". You can see where Jesus Christ gets the phrase, "it is easier for a camel to go through the eye of a needle then for a rich man (Beth) to enter the kingdom of heaven." The numbers "#2 & #3" represents the male & female respectively. This is why Christ would say, "when two or three witnesses are gather together in my name there am I in the midst of them". At the wedding in Cana as told in the gospel of John, there were six jars (6-Days of Creation) of water and at the bottom of each jar were put two or three firkins. The marriage of Cana deals with the span of an individual's life (divorce) and has nothing to do with marriage as we knows it. These 10-letters actually give us numerous patterns that are found in the Old Testament: amongst them being the Ark of the Covenant, Noah Ark, the Kabbalistic Tree of Life found geometrically perfected in the first chapter of Genesis. Note that Noah's Ark give measurements of 300 by 30 by 50. Let us take the zeroes away and we have 3 x 3 x 5. When you view the Genesis Formulae you see 10-letters: 4 on the right side and 6 on the left side of the dividing line. When we break these down to fifth we have 2 on the right and 3 on the left. Which gives us 5 in total length. The Zohar tells us that the six letters of the Hebrew word Bereshith represent the six direction, which implies a cube or a sphere. When we consider a cube we have 3 x 3 x 3. This calculation: 3 x 3 x 5 = 45; is the same as the Genesis Formulae (0.60 x 45 = 27 & 0.40 x 45 = 18). Whereas, in the Ark of Covenant a similar play is made on its mathematic by saying one and a half cubits by one and a half cubits by two and a half cubits ( 3-halves by 3-halves by 5-halves). This is the same as Noah's Ark and the Genesis Formulae. It is no brain strain to see that the 39-books in the Old Testament and the 27-books in the New Testament is very close to this 60/40 breakdown. This clearly puts the Old Testament as the material creation and the New Testament as the spiritual creation. The #27 has one unit more, but the #27 represents the cube of #3. The #3 represents the soul. This is incredible symbolism because the inference is that the sacred scriptures is Noah Ark or the Ark of the Covenant. The ancient Greeks wrote their mythos as if the human body was a ship on the sea of life. I see no difference here in the mythos of the Bible. The Old Testament has 3 x 13, and the New Testament has 2 x 13 + 1. It is suggestive that the Old & New Testament have God sitting between them (3/1/2). On one side is 26-volumes, which infers Yahweh, and on the other side 39-volumes = 39 = 12 or the gods (Elohym) as if to imply the Trinity. This implies that the material world takes on an opposite position from its spiritual counterpart. Most of all I want to demonstrate out of the pattern from of the Genesis Formulae the calendar's pattern. 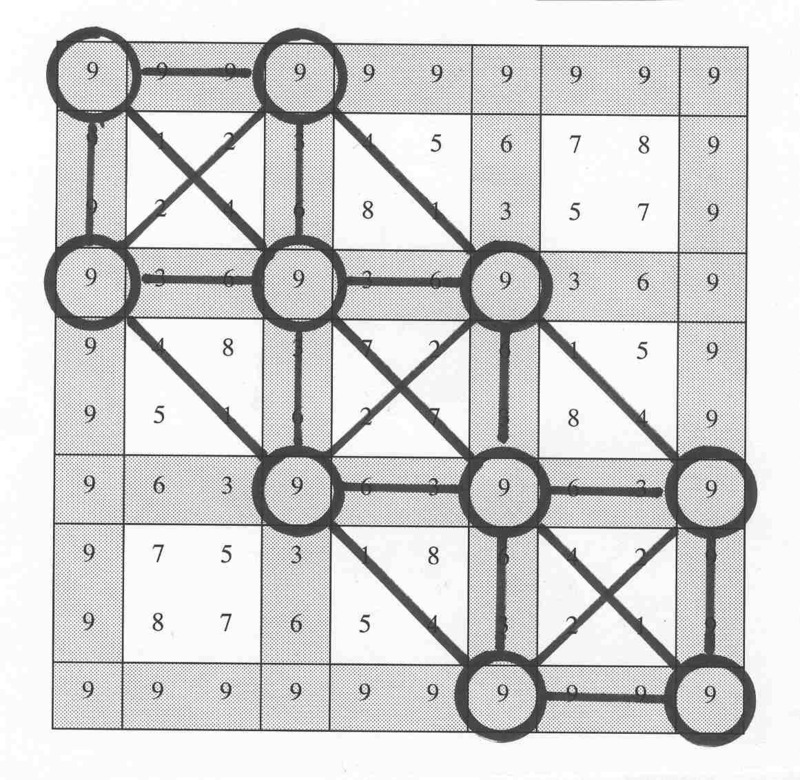 When these ten numbers are placed in a circle we find that the two fours come together. Immediately the four #1s are seen in a pattern similar to the one seen in the Zodiac/Calendar Year, which produced the Star of David. When these 10-numbers are placed in a circle and each of the fours are reduced to two deuces as is done in the letter Beth & Resh we find we have 12-positions. This is 6-duces, 4-ones, & two-threes (separated six). Counting from the first one as #1 (April/Aries) and going counterclockwise we find that the next #1 would be counted #3 (June/Gemini), and continuing on we find that the third one is counted as #6 (September/Virgo), and finally the fourth one is counted as #8 (November/Scorpio). In one of these above diagrams I demonstrate that the four ones are so positioned they stand out with the same pattern as that in the calendar that produces the Star of David. The Tav-4 & Daleth-4 are reduced to four #2s. This may appear at first blush to be pushing it until the rest of the data in this paper is evaluated. There is no need to rehash the first letter of Genesis here relating to the words 'House and Inn". We have already covered that area above in Matthew & Luke's gospels. The fact that the first letter of Genesis: Beth, is interpreted to mean "in & house", gives us more than enough evidence to believe that it is the source of the material the gospel writers used in constructing their Nativity narratives. The letter Beth as a word is made up of three Hebrew-Letters: Beth-Yud-Tav, which gives us a total numerical value of 412. The second letter of Genesis also has a common denominator of the #2. In Hebrew Gematria Beth (2)-Resh (200)-Khaf (20) are interchangeable. In fact all the Hebrew letters have similar pairing such as Aleph(1)-Yud(10)-Qoph(100). From Beth (2) comes RESH (200). The first letter of Genesis is Beth: the next letter is RESH, as if Beth had been impregnated. This means the letter Beth opens up and receives RESH (Reish: is 2nd spelling of Resh with Yud not Aleph) as a fetus: [BETH-resh-aleph-shin-YUD-TAV]: thus the word Bereshith came into being. This implies the birth of the Jew. But Aleph sitting between Resh & Shin or between "#2 & #3" implies the child can either be Jewish (2) or a Gentile (3) (male or female). When we look at the 6-letters of Bereshith from a numerical point of view we find an extraordinary discovery: 4-1-3-1-2-2. We find that in the 2nd Day of Creation Heaven is introduce and in the 3rd Day of Creation the dryland called Earth appears. It is as if Genesis is interpreting the words and numbers for the reader. 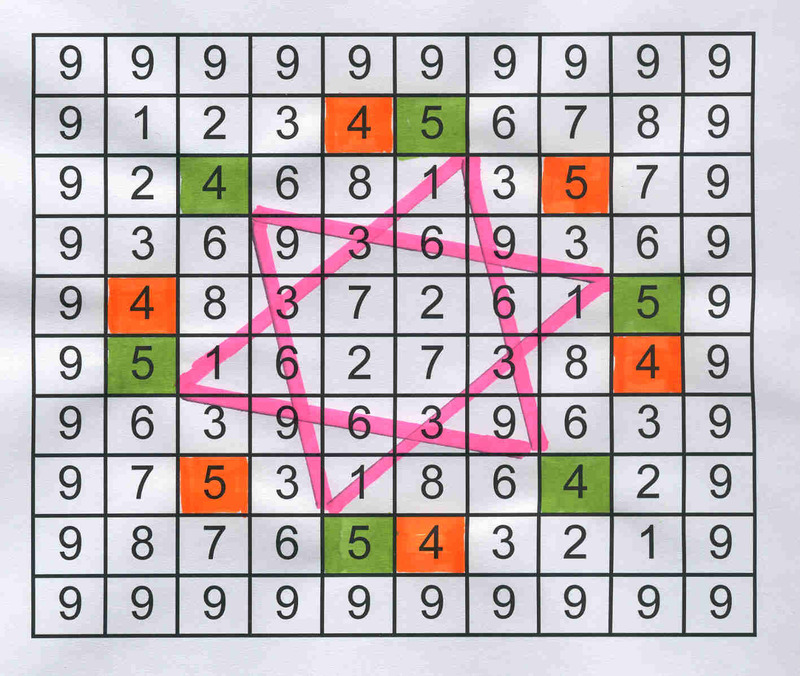 When we look at the 6-numbers of Bereshith we find that Aleph sits between #2 & #3. Aleph separates them. The Zohar tells us that Yah equates to the word Yahweh and that infers the opposite that Aleph equates to Elohym. The word BARA, which is translated 'created' also can be interpreted as 'choose, select, separated'. The Dogon Tribe of Africa uses this word to mean 'help'. When we see these definitions in relationship to the actual positioning of the numbers in the 6-numbers of Bereshith we can say that Elohym (1) separates the Heavens (2) and the Earth (3). From this interpretation we can literally write the first verse of Genesis: "In the beginning God separated the Heavens and the Earth". That is the normal English translation of the first verse of Genesis. That is only using the first four letters of Bereshith. Beth would represent Bereshith: 'in the beginning'. The interesting part of this interpretation is that I had not yet taken into consideration the YUD after SHIN nor had I considered the QOPH before BETH in relationship to the Genesis Formulae. When we actually read what the Torah says in verse #1, from the Hebrew text, we find there are two identical words "eth" using the "Aleph & Tav" not translated. This word is used 26-times in the first chapter of Genesis and never translated. This word 'eth' is translated "beginning & end' (first & last letters of the Hebrew Alphabet) from the two letters that make it up. Christ said, "I am the alpha & the omega, the beginning and the end, the first and the last". Here in this first word of Genesis is a direct illustration of that idea. Is this the hidden New Testament for the Jews? Is this telling the Jews they must study that which they have rejected? Yet, the same hidden "26-eths" implies that Christians must study Judaism to understand itself. 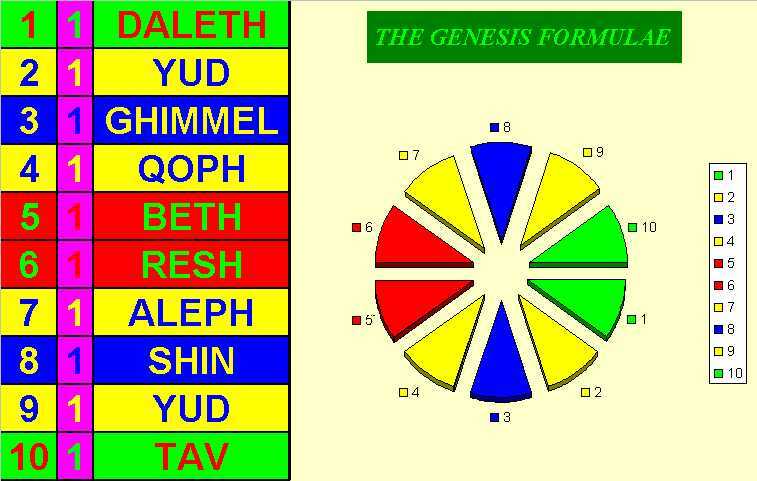 The word YAHWEH has a numerical value of 26, which implies that the first chapter of Genesis is dominated not by Elohym but by Yahweh. When we read the Targums another sacred text of the Torah, written similar to our version, it tells us that Yahweh created in the first chapter of Genesis. Actually the Trinity dominates the first chapter of Genesis. Now let us read those 6-numbers in the word Bereshith again and include the Qoph before Beth. What the Yud, Aleph, & Qoph suggest from the reading of the first word of Genesis is that they all mean Elohym: as in "in the beginning Elohym separated the beginning and end of the Heavens and the beginning and end of the Earth". This implies the Trinity at work. Extraordinary, isnt it? In the 2nd verse of Genesis "the Spirit of Elohym hovering (moving) over the face of the waters" is suggestive to the end of the word Bereshith: TAV. The letter Tav & Daleth are both from the series of #4s. The one #4 not present is MEM = 40 = waters. So we can see that waters is implied with all three letters: Daleth (4), Mem (40), Tav (400). It can actually be demonstrated that the first chapter of Genesis are these waters (and by interpretation the sacred scriptures as a whole). Now when we read the 1st verse of Genesis we can see that it represents the RESH inserted into the letter BETH. Bereshith has now taken on the role of the letter Beth, the 1st verse takes on the role of RESH spelt out, and the 2nd verse represents the YUD & TAV in the spelling of BETH. 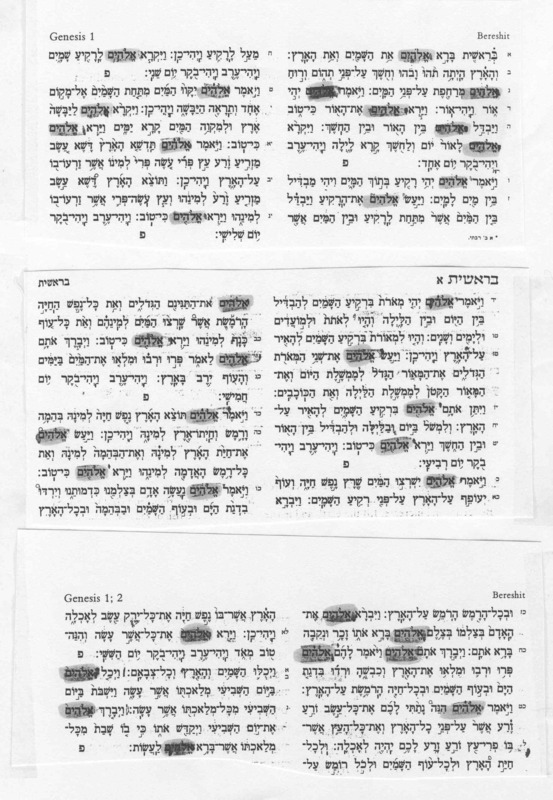 Therefore, the first two verses of Genesis is interpreted as BERESHITH. In turn the first two verses become BETH, the first four days of creation represent RESH spelt out, and the 5th & 6th Days of Creation represent YUD & TAV of the letter Beth. 54th) Beth as an archetypal pattern is continuous. The First Chapter of Genesis become BETH, the 2nd to the 4th chapters of Genesis becomes RESH spelt out, the 5th chapter YUD and the story of the Flood is TAV. So we have found a basic pattern in the Genesis creation story. By telling you this interpretation I have been able to introduce you to the concept that every Jew born is potentially the Messiah. The word Elohym is a feminine one. The #3 is the number for Earth and for woman, whereas, #2 represent Heaven & man. Just because the word Heaven is used doesn't mean it is spiritual. The #3 represent the soul that has been converted back to Elohym. This is the birth of the Christ child. So a person can be 50 years old (or whatever age) and be born-again. In other word he has become the Christ child. There are 434 Hebrew words in the first chapter of Genesis. There is only one letter in the Hebrew alphabet that has the numerical value of 434 (spelt out) and that letter is Daleth: #4, which symbolically means Door. Christ tells us that he is the door. Notice that Daleth is the first letter in the Genesis Formulae. The #69 is very prominent in the first four chapters of Genesis. 69-groups of words in the first chapter of Genesis combined by hyphens. There are 1449 words in the first four chapters of Genesis. When 69 divide this total the quotient is 21. The 22nd #69 is the 69-groups of words (combined by 80-hyphens) in the first chapters of Genesis. This is obviously a tribute to the 22-letters of the Hebrew alphabet. When the #69 is subtracted from the 434-words in the first chapter of Genesis the remainder is 365 or the amount of days in the Solar Year. There are 80-hyphens in the first chapter of Genesis which produces the 69-groups of words. When 80 is subtracted from the 434-words the remainder is 354-days or the amount of days in the Lunar Year. The interface of the Solar & Lunar Years to create the 38-year Luna Cycle as seen between 46 BC to 8 BC seems to have its origins here in the first chapter of Genesis. This play on the calendar, which appears to be a material science, is outlined in the beginning of the sacred scriptures more or less sanctioning their use in religious rituals. There are 32-Elohyms in the First Chapter of Genesis. These Elohyms are mystically numbered 1-32, which gives us an aggregate of 528. 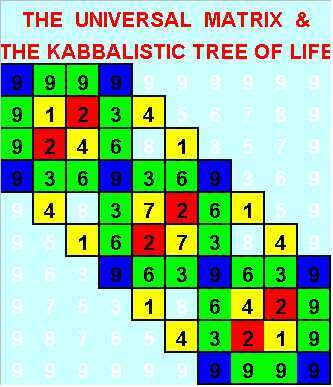 These 32 Elohyms coincide with the Kabbalistic Tree of Life. The first four days of creation total from 3-18 an aggregate of 168 (hours in a week). This is one half the diameter of the circle: 16 Elohyms. The figure 168 x pi = 528. This definitive demonstrates that the author of Genesis understood the concept of pi. 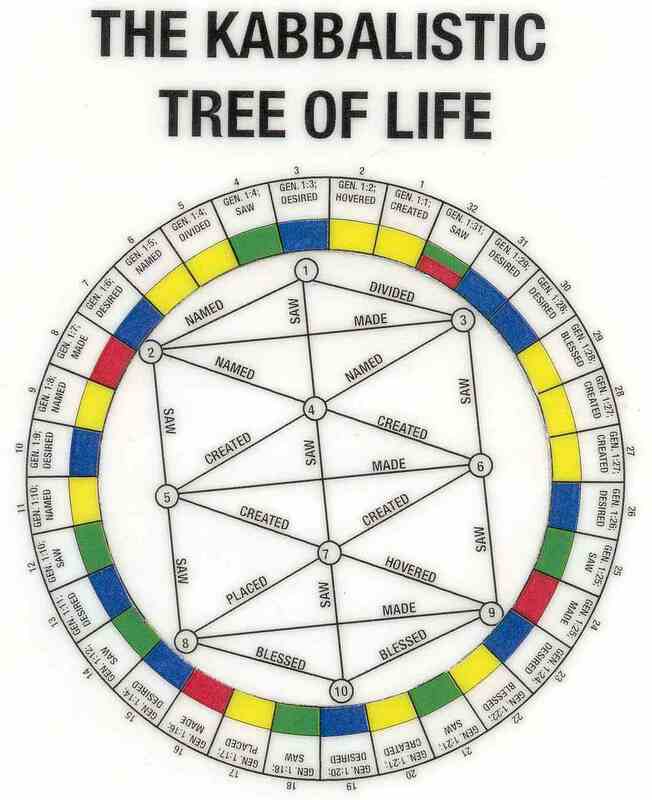 This 168 can be shown by the different categories of the Kabbalistic Tree of Life to represent the 7-day week. I suggest that the reader study the first four days of creation in relationship to the Kabbalistic Trees categories. These first four days have 9-distinct patterns. Beginning with Lemmed and going counter-clockwise, in a circle, the formulae for pi is numerically played out: 3.1415. The fact that Elohym is placed in a circle demonstrates that Elohym represent Christianity: The Messiah will return implies a circle. Yahweh is on a straight line implying a time-line, which is forward and never in reverse. This is the major difference between Judaism & Christianity. The Universal Mathematical Matrix is a mathematical device I discovered in my quest to break the mathematics of Dante Alighieri's (1265-1321) La Divina Commedia. Later I would realize that the author of Genesis used this same matrix to guide him in structuring the First Chapter of Genesis.